I often use international call for my family, I use telephone card which is much cheaper than regular phone call, but you still need pay phone fee. Of course, you can try some internet phones like Skype, or instant messengers like Yahoo Messenger, MSN Messenger, these clients can make phone call via internet, and it also cheaper than regular phone. But I still want to search free lunch. 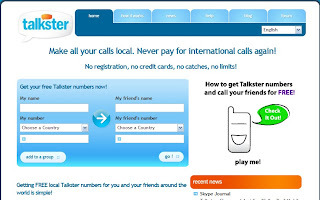 Talkster is a website that provided long distance or international phone call service. It is not like other VoIP service, it makes long distance or international to local phone charge. I do not know how Talkster work, it seems very good for me, because you do not need use computer after you got local phone numbers, you can use your regular phone or cellphone to call your friend. You do not need register, credit card, prepayment, only you need to do is go to Talkster, put your phone number and country, your calling phone number and country into table. You will get two local phone numbers, one for you, another one for your calling destination. After that, you do not need computer. First calling seems difficult, at least for me. You need use your local phone number that Talkster gave you, that means you need dial local phone number. After that, you need hold on your phone till it connected destination. It is not easy for most users, because service only offers you 10 seconds to talk to destination caller. It requires your destination caller hang up first, and use a destination local phone number call back to you while you still hang on your phone. Remember, make every calling that need both sites to dial each local phone number. I tried several times, it works but it is not easy, you need wait a while. The calling quality is good, that makes me a little bit surprise. I do not know how it makes free, I mean you use Talkster phone service is free, you only need pay is your local calling. You need go to Talkster check out if your country on the open list.